Japanese stiltgrass (also known as bamboograss flexible sesagrass, Japanese grass, Mary’s grass, microstegium, Nepal microstegium, Nepaleze browntop, or Vietnamese grass) is a summer annual commonly found in shady, moist areas, and is spreading rapidly in woodlands as well as shaded landscapes and low maintenance turf throughout the southeastern United States, Mid-Atlantic States and north to New England (Figure 1). Japanese stiltgrass germinates in early spring, several weeks before crabgrass, yet flowers and seeds much later, from mid-September through October. It has broader, shorter leaves than most other annual grasses; somewhat resembling broadleaf signalgrass or spreading dayflower. After frost, the foliage and wiry stems turn a distinctive light tan in color and persist through the winter. Vegetative identification characteristics include: rolled vernation, a very short membranous ligule, and leaf blades that are shorter and broader than most other grasses. Figure 1. Japanese stiltgrass habit. Japanese stiltgrass is a prostrate to erect, sprawling and freely branched summer annual with spreading stems that root at the nodes. The stems are stiff and climb over other vegetation reaching more than 3 feet (~1 meter) in height but will remain prostrate if mowed. Leaves are rolled in the bud; ligules are short (~0.5 mm) membranous with hairs on the backside; auricles are absent. 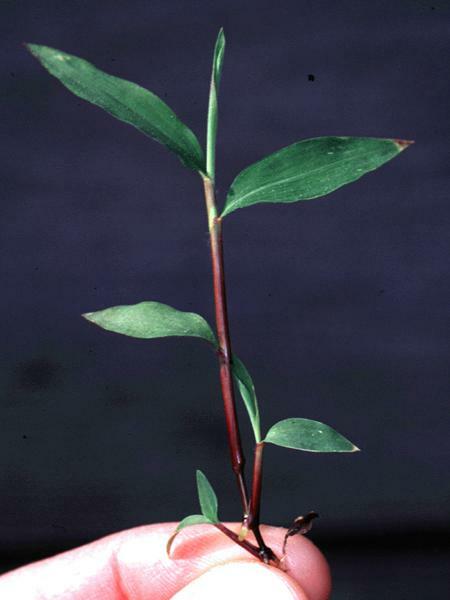 Leaf blades are broader than many other grasses, particularly under shady conditions (Figure 2). Young seedlings are easily distinguished from other summer annual grasses by the very broad, rounded first leaf (Figure 3). Leaves on older plants are narrowly elliptic, about 8 times longer than wide (3 to 8 cm long and 5 to 10 mm wide), sparsely hairy on the upper surface, and hairless or nearly so on the under side. The sheath has a hairy margin and hairs at the collar region but otherwise is not hairy. With age some of the hairiness of the upper leaf blade may diminish. Plants have a shallow fibrous root system. Plants tolerate mild frosts, often flowering after the first frost, but die with hard frost. Dead plant parts persist through winter and well into spring and early summer (Figure 4). Figure 2. Note the relatively short, broad leaves on Japanese stiltgrass. Figure 3. 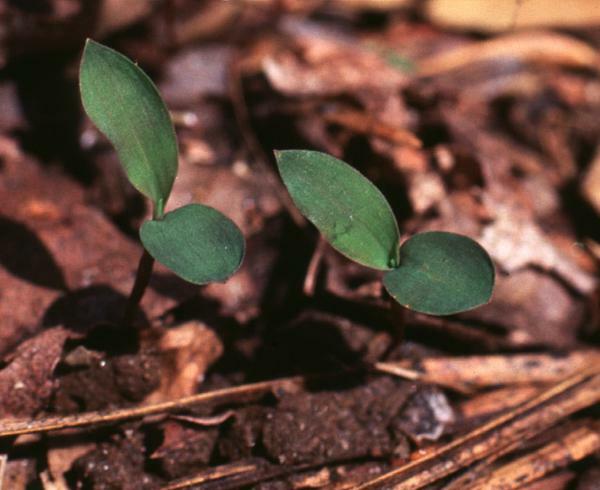 Japanese stiltgrass seedlings, with distinctively rounded first leaves, emerge in early spring through mid-summer. Figure 4. 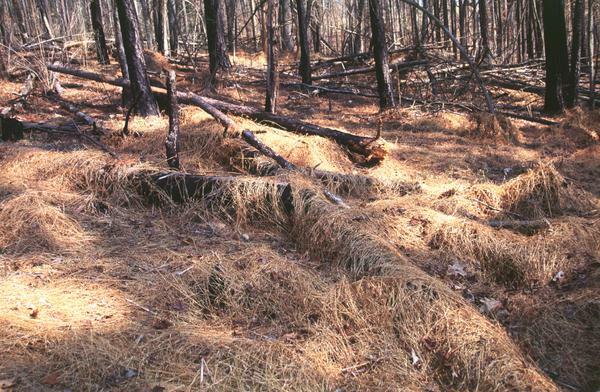 Dead, straw-colored stems persist through the winter. 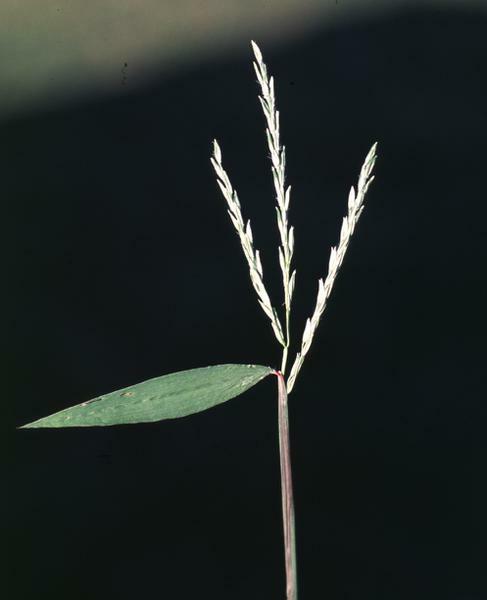 Japanese stiltgrass is most commonly found in shady, moist, disturbed areas including wetlands, ditch banks, utility rights of way, mulched landscape beds, and low maintenance turf; however, infestations are common in upland forests as well. Infestations typically begin in disturbed sites; once established, infestations can spread to undisturbed areas. Introduced from tropical Asia, it has spread rapidly in public lands throughout the Eastern United States. It is most common in woodlands of the piedmont and mountains of the southeast, less common in the coastal plains. A summer annual; reproduction is by seed that germinate in early to mid-spring (early to mid-March in central North Carolina) and sporadically throughout the growing season. Plants flower in early to mid-autumn (late September through October in central North Carolina). Flowers are produced in a branched spike, with 1 to 3 (rarely 6) branches (rachis), each 3 to 5 cm long (Figure 5). Flowers also produced within leaf sheaths; these flowers do not expand beyond the sheath and thus are rarely noticed. Spikelets are in pairs on the rachis, each 4.5 to 6 mm long and hairy, one sessile and the other on a short pedicel. Only one of the spikelets in each pair is fertile; the fertile one sometimes having a slender awn 4 to 8 mm long. Japanese stiltgrass can produce large numbers of seeds – from 16,000 to 50,000 seeds per square meter. At least some of those flowers are cleistogamous (self-fertilized before the flower opens). Such an adaptation has direct implications on sanitation measures; to prevent seed production, early removal before anthesis is imperative because some florets will produce seed before flowers have opened. Figure 5. Japanese stiltgrass plants flower and seed in mid- to late autumn. Since Japanese stiltgrass infestations typically begin in disturbed areas and then spread from those sites, early detection and control can prevent severe infestations. Research suggests that seeds remain viable in the soil for less than 7 years, and that populations rapidly decline when control measures prevent seed production. Therefore, long-term management programs should emphasize prevention of seedhead formation to deplete the seed reservoir. Mulches are generally ineffective. Regular, close mowing reduces seed production. Mowing once in late summer can be as effective as frequent mowing in reducing seed production. Hand weeding is effective on small infestations but is generally not practical for larger infestations. Flame weeding has been shown to be effective in moist sites where fire hazard can be mitigated. When flowers are first visible, many seed will mature even if the plants are mowed or pulled. Therefore, mechanical control should be done before flowers are visible. Very few herbicides are specifically labeled for Japanses stiltgrass control. Furthermore, few herbicides are labeled for use in the wet woodlands where this weed is common. However, most preemergence and postemergence herbicides used for crabgrass control in turfgrass and landscape plantings are effective on Japanese stiltgrass. Herbicides specifically labeled for Japanese stiltgrass control include: imazapic (Plateau), fenoxaprop-p (Acclaim Extra), imazamox (Clearcast) and metsulfuron + sulfometuron (Sulfomet Extra). Plateau may be applied preemergence or postemergence to Japanese stiltgrass. The other herbicides should be applied postemergence; all but Acclaim Extra will also provide some residual control. Consult the herbicide labels for details and restrictions. Several preemergence herbicides registered for use in turfgrass and landscape plantings have been shown to be effective on Japanese stiltgrass including: trifluralin (Preen), dithiopyr (Dimension), oryzalin (Surflan), pendimethalin (Pendulum), prodiamine (Barricade), isoxaben + trifluralin (Snapshot TG), and oxadiazon (Ronstar). S-metolachlor (Pennant Magnum), benefin + trifluralin (Team Pro), napropamide (Devrinol), and indaziflam (Specticle) were less effective. If preemergence herbicides are to be used, applications must be made before the weed germinates - which occurs several weeks before crabgrass germination. Research has also demonstrated that non-selective herbicides such as glyphosate (many trade names) and glufosinate (Finale) provided excellent control with one or two applications, respectively. Glyphosate has been shown to be very effective at low doses. Other selective postemergence grass herbicides including sethoxydim (Segment), fluazifop-p (Fusilade II) and clethodim (Envoy) were also effective. In natural stands of Japanese stiltgrass, the effectiveness of Acclaim Extra, Segment and Plateau were equally effective when applied early season (pre-tiller), mid-season (1 to 2 tillers) and late season (pre-flowering). In general, two applications provided greater control than a single treatment. Dimension, MSMA and Drive (quinclorac) were not effective for postemergence control. ** Before using any herbicide, read the label and follow all label directions and restrictions.